Dr David Malangi was born in central Arnhem Land the year after the Methodist Mission was established at Milingimbi. His early years were spent in this area, where he received initiation into Manyarrngu culture from his parents and extended family. He began painting in earnest after World War II. In Australia, Malangi is probably best known as the artist whose work was featured, without his knowledge or permission, on the one dollar note in 1966. He was also one of the first Aboriginal artists to have his work included in an international exhibition of contemporary art, at the Biennale of Sydney in 1979. In 1988 he collaborated on The Aboriginal Memorial – a group Of 200 log coffins now on permanent display at the National Gallery of Australia, Canberra – to mark 200 years of European occupation of Australia. Malangi was honoured with the Australia Council Emeritus Award in 1998. 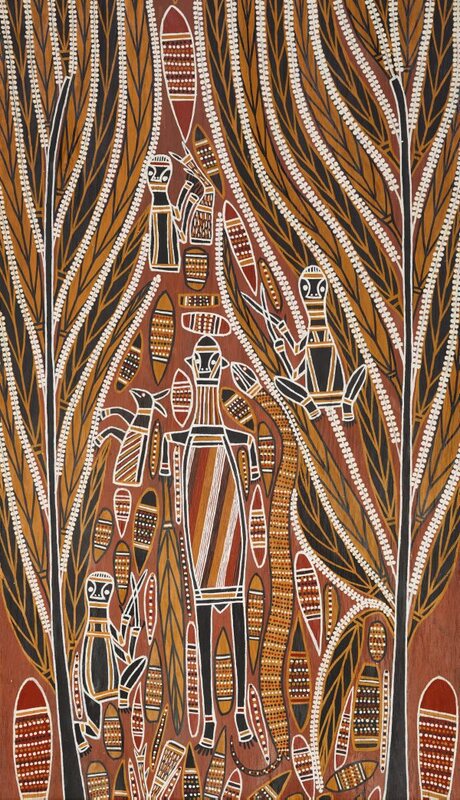 'Gunmirringu funeral scene', 1983, was one of eight bark paintings that the artist exhibited in the 1983 Australian Perspecta at the Art Gallery of New South Wales, Sydney, as an incontrovertible land rights statement. The works were created and put together after discussions with the artist about his concerns for the safety of his sacred sites, under threat from mining and commercial fishing. Gunmirringu, the great ancestral hunter, is central in Malangi's art. Here, Gunmirringu is shown lying in state. His clansmen are around him, holding clapsticks, singing ceremonial songs and dancing. Darrpa, the deadly brown snake, which bit and killed Gunmirringu, is shown alongside. Around him also are the spoils of his last hunt: yams, nuts and a butchered kangaroo, which commonly refers to the death of a person. Gunmurringu's was the first funeral, and this story tells of how death came into the world. It is enacted through ceremony and art to assist the passage of the soul after a member of the clan dies. In this composition, the ceremony is framed within two flowering stringy bark trees. These trees often refer to the raga, or white berry bush, under which Gunmirringu sat, cooking his food, when the snake struck. The beautiful small bark, 'Food pattern of trees', is a more direct reference to the raga. It is a much earlier painting than 'Gunmirringu funeral scene'. Its overall design is more intricately wrought and its colours softer than later, more characteristic, barks by Malangi. Bruce James, Art Gallery of New South Wales handbook , 'Australian Collection: Aboriginal and Torres Strait Islander Art', pg. 208-241, Sydney, 1999, 223 (colour illus.). Steven Miller, Tradition today: Indigenous art in Australia , 'Dr David Malangi', pg. 72, Sydney, 2004, 72, 73 (colour illus.). Djon Mundine, One sun one moon: Aboriginal art in Australia , ‘The concept of style in Central Arnhem Land’, pg. 99-104, Sydney, 2007, 101 (colour illus. ).